Students at Cornell University College of Veterinary Medicine are the latest to hone their surgical skills without the need for cadavers or live animals. Never has the idiom “practice makes perfect” been more applicable than when it comes to mastering high-risk surgical procedures that require a steady hand and exceptional attention to detail. Historically, aspiring veterinarians practiced surgical techniques on live animals or cadavers in a laboratory setting. More recently, those methods have been supplemented or replaced at some universities by 3D printing technology that creates replicas of animal body parts and organs. Each of these methods has drawbacks, however, including the need for cadavers to be defrosted appropriately and the lack of access to and the sheer cost of 3D printing technology. 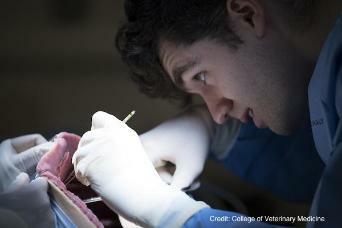 Cornell University College of Veterinary Medicine is taking a different approach. Veterinary students there have been practicing procedures on state-of-the-art synthetic canine cadavers. The models mimic living tissue, with individual muscles, bones, and organs; they even bleed and breathe like living patients. The synthetic dogs come from SynDaver Labs, a company best known for designing human replicas and for an appearance on the popular entrepreneurial TV show Shark Tank. Earlier this year, the college purchased 3 cadavers: 2 abdominal models and 1 full-sized canine unit. The University of Florida and Texas A&M University also use synthetic canines from the company. “The SynDaver units create a learning environment where surgical procedures can be effectively taught and practiced while minimizing the risk of exposing live patients to the errors a novice surgeon may commit,” Galina Hayes, BVSc, MRCVS, PhD, assistant professor in the department of clinical sciences, told the Cornell Chronicle. Each model is made from water, fiber, and salt. Incisions made on the outer layer can be patched while internal organs are replaced after several procedures. With the models, the students practice real-life situations such as intestinal obstructions and hemorrhaging vessels under the supervision of established veterinary surgeons.